thank you to everyone who participated in and followed this years contest! I’ve been so inspired by the imagination within our community, and seriously appreciate the time, thought, and attention to detail that was put into creating your incredible dream girls! congratulations to you all for putting your heart into your work and sharing with us, that takes some vulnerability and i am so grateful to get a glimpse into your creative worlds! I LOVE YOU SO MUCH my dreamers!! 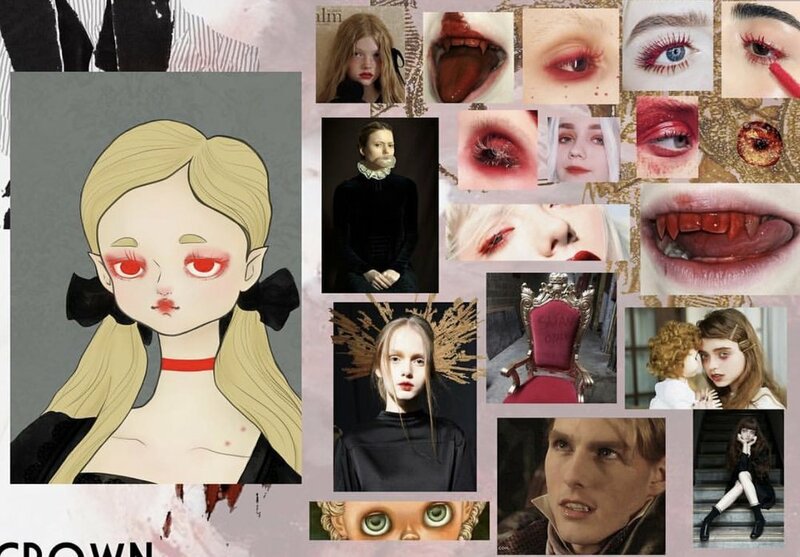 dakota rose is an arrogant vampire heiress who spends her nights brushing her golden hair and using her dollish good looks to lure her prey into her rose garden. she is small, delicate and dangerous. however, dear reader, be warned - no matter how sweetly she calls you, do not enter her rose garden, for her sole desire is your undying love. passing through a silk screen of deep and heavy blooms, she calls to you. always just around the corner, the glimpse of her face teasing you. time standing still as you dance through mazes of stone walls and blood roses. you cant stop. she’s playing with you. a tug at your heart and it seems to be colder. you’ve lost your way. like a lamb to the slaughter, staggering dumbly onward. forever onward. through endless twists and turns, she laughs, her mockery echoing out like a bell. the thorny brambles snap out at you, cutting and biting flesh. her eyes - perforating orbs in the darkness are stalking you. red lashes and black velvet bows. you’re afraid - a blind fawn stumbling for it’s mother. a choking cry and a flurry of movement, it cuts you deep. the heat of the pain and the spray of blood lights up the dark. now you cant move and the fog is creeping over your eyes. immobilized by pain and fear you are helpless. the roses hissing and nodding in the wind. like a bird of doom she starts to loom, needle mouth sucking the life from your neck. your eyes fall heavy and you start to die slowly becoming another rose in the garden. eye shadow: bright red eye shadow to match the lashes, the red starting at the lash base and smoking out to softer pink. small silvery white accents for tear ducts. lips: two small fangs to bite her prey. lip color; very soft pink gradation lips in a small and dolly like shape. glossy lip finish. slight mocking smile. wrapped in a world of color, valencia runs through the shiny fields of starlight. desperately running from her past and searching for a way to make it through. her only comfort is at night. her friends the stars help her in any way they can. she’s falling apart at the seams, breaking from the relentless struggle of escaping her old world, and self. her only light is the stars. they shoot across the sky in radiant colors, whispering to her that they will do anything to help. during the day she protects their skies and fields from others that want their power. during the night, they do everything they can to help her in return. some brave friends get close, letting their light fall into twists that weave into strands around her. she grabs and pulls any piece she can, while it wraps itself around her in comfort and protection. during the day, she sees how much they’ve helped. with every strand she grasps, she turns more and more into starlight. glowing more each day than the last. the clothes they’ve fashioned are light and airy, letting her jump and run whenever she needs. her makeshift dress shines in colors of pink and orange. her hair grows longer and brighter each day, a shining blue that almost seems to reflect the daylight sky of her new world. her eyes glow more than anything. they change in color, never staying the same for long. they are aglow in shades of blue, orange and pink. not long ago she noticed the small gold flecks across her, signs of the light and warmth they’ve showered on her. in the beginning (and sometimes even now) she would cry, wondering if she’s on the right path, sometimes feeling so alone. she’s hoping to stop running soon, and it seems like that might happen. lately she’s been hearing new whispers, faint sounds that she’s getting closer and closer to where she belongs. even if it takes time, she’s content. happy that she’s no longer the princess of a long forgotten city, but has instead made herself into a princess of ribbons. is etienne a forest faerie or a wood nymph? perhaps she’s a dryad or a nomad! or maybe she’s a witch lost in time… “by the morning maybe we’ll remember who i am. maybe you’re the night who saved my life.” what i know for certain is she’s an enigma wisping through the moss laden trees and the dew soaked fields, collecting lost and abandoned gossamer wings, broken legs and antennae and studying them with great intent. she wants to save all the crawly critters of the night that most would turn and run from. but most importantly she’s discovering the decline of insects crucial to our ecosystem. she’s sowing milkweed and nectar plants and hoping to do her part in saving a few monarchs and honey bees. etienne has dark ashy roots that ground her down to her flowy hair turning to a shade of mint green to match all the soft luna moths and delicate lacewings fluttering about. she wears light silky threads, but also fancies a bit of dramatic flair like some of her 6 legged friends and even have them crawling over her and adorning her hair no doubt. she’s a tree hugging, bug saving nature girl through and through and would have eyes to match her loves. clothes: dapper but worn, boyish and warm — muddy knees, a leather satchel, a crown of mushrooms, oxford shoes or hiking boots, and a cozy knit scarf for cold mornings. this is vague because honestly i’d like to see how he’d be interpreted! gunnamullie - she was raised in arnhem land in the northern territory of australia. she has dark dusty brown hair with flecks of gold from spending long days in the sun. most days are spent playing with all the other aboriginal children in the creeks and exploring the vast landscape of the outback. she also learns her traditional culture from her elders about her ancestors and the spirit world. she also takes part in the women’s ceremony dance where she dresses up with eucalyptus leaves from the native gum trees around her arms and grass skirts and ocre paint on her face which is used for aboriginal art, cave painting and face paint. her eyes are dark brown but can sometimes change to a gold like the embers of her campfire. other times they can look like a hazel/green color like the local billabong where they swim. she mainly wears a pair of shorts or skirt. just comfortable cool clothing that allows her to move freely while exploring the dusty red earth of the australian outback. her skin is dark like charcoal which protects her from the harsh sun. she is a healthy, beautiful australian child. this girl would be my “dream doll” as i have always loved the aboriginal culture and have grown up with a fair few. i’m very proud of their culture and feel very passionate about them. the true definition of indigenous means belonging or occurring naturally in a particular place (oxford dictionary). it is used throughout the globe to describe all first peoples (native people) and even flora and fauna. i also love reconsiliation australia which oversaw the recognise campaign, which promotes greater awareness of, and support for constitutional recognition of australia’s first peoples. this doll exists in the future when human is no longer there. she is one of the remainings of human creation cherished by them long time ago. she has minimalistic but sophisticated appearance made out of marble or stone. her makeup is carefully applied on smooth surface but slightly disappearing due to years she lived through. there is no human to call her, so she does not know her name anymore, but she still remember those days. it has been long time since disappearance of mankind, so everything they created is kind of dusty and rusted, and slowly decaying itself. on the other hand, flowers and plants return back, and grow over ruins and remainings. she should have marble or stone-like skin, so probably matte textured, and colored white or grayish. her long hair color matches to her skin color. her eye color matches to her skin and hair color because she is stone statue looking. her body has a lot of kintsugi (golden joinery) and gintsugi (silver joinery) due to repairs done by people when they were alive. she is also decorated with accessories made of pearls. due to growth of nature, her body and hair is covered by many wild flowers and plants. golden-haired cressida was so named when her parents first gazed upon her soft, milky, moon-shaped face. her husband wulfric was a mariner who boldly traversed the beloved, but oft treacherous sea. one evening cressida gazed outside upon wulfric’s ship caught in the throws of a menacing maelstrom. her eyes filled with terror as his ship was engulfed by the furious waves. each day cressida, crestfallen doleful, would swim until she could swim no more. searching, seeking, but never finding wulfric. days turned into years, her spun gold hair now dull white as the dusty cobwebs enveloping her heart. then one night cressida noticed a star shining more brightly than any she’d seen. a beacon, a sign - perhaps a miracle? hope filled cressida’s heart as she dashed to the water’s edge and the star answered when she made her wish! “your wish will be granted, but no wish comes without a price… this time when you enter the sea, you shall never return, but i promise you will have all that you yearn!” “what more can i lose,” said cressida, “when all i love is gone? 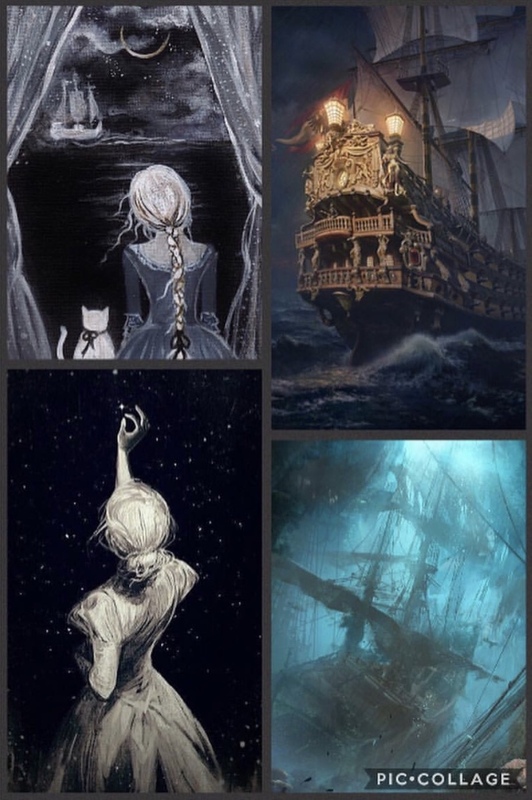 tell me what i must do!” the star solemnly replied, “into the sea you must go and cry out with all your might ‘oh sea, swallow me!’ and it will be done.” cressida mustered up every ounce of courage and slowly walked into the sea. her voice usually soft and timid could be heard for untold miles. “oh sea swallow me!” waves swirled around her as her vision grew dark. oh sea, you are swallowing me, her life rapidly fading. such a fool i have been! cressida was slowly sinking when suddenly her flowing white dress began billowing, as did her beautiful long hair. wondrous light filled her skirt with a magical glow as she floated effortlessly, her trailing hair now bathed with silvery white moonlight. the shimmering water reflected in her pearlecent eyes - a beautiful jellyfish mermaid. cressida’s heart began fluttering so rapidly she felt it would surely explode - for there he was, her love. the sea had spared wulfric, now a merman, and he grasped cressida’s hand. off they swam to the place they’d always be - together forever in their kingdom under the sea. let me introduce you to my literal dream girl gummy; the girl who ate so many bubblegums that she became a bubblegum herself. the bubbles and gummies are popping out all over her body. i’ve literally dreamed about this girl in my sleep, and i want to bring her to life by g.baby. she’s also inspired by a song i used to sing when i was little; the the gumball tree song, i was getting so much fantasy out of it, and besides that; who wouldn’t like a gumball tree in their garden? gummy’s story: an adam and eve story, but then different. gummy lived in a very small farm together with her grandpa billy. her grandpa was always busy with experiments. his biggest and most successful experiment was his gumball tree. billy always said to gummy “dont touch this tree, the gumballs might be dangerous or could give very weird effects on your body, trust me.” gummy is a very loyal girl but when it comes to candy she cant hold herself back. of course she ate from the tree, as you might have expected already. she couldn’t stop with eating, the balls were so addicting and the vibrant colors with amazing flavors weren’t helping her. the white vanilla cookie dough flavored balls were gummy’s favorite, so she ate those first. her hair was slowly turning white while she was eating more and more. after she finished with all the white gummies she started off with the pink ones. the incredible taste of strawberry, cotton candy and watermelon couldn’t stop her. the pink gumballs were growing back, but not from the tree. the balls were coming out all over her body. she continued eating by plopping the balls out of her body but they kept growing. 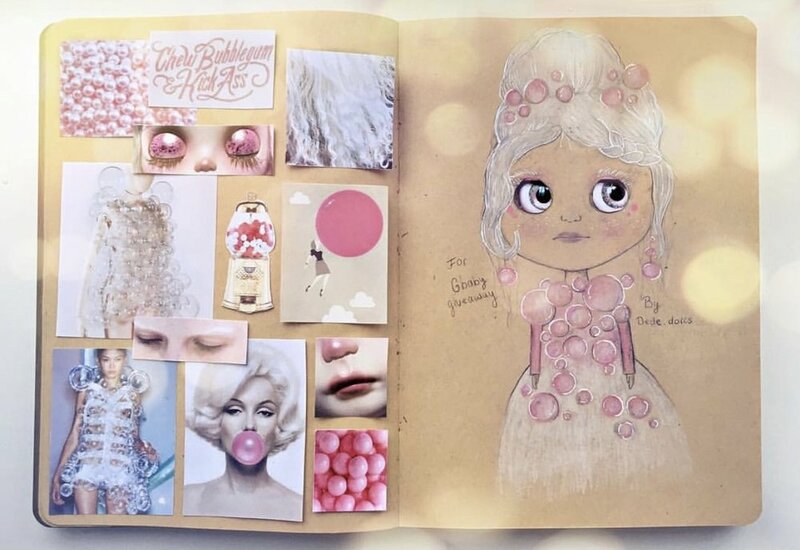 these days she’s still walking around with her white vanilla hair and cotton candy balls, it made her who she is today; gummy the gumball girl. gummy is a pale girl with a white mohair reroot. she mostly wears it in a bun with a braid. she has gumball pink lips, blush and eyeshadow. underneath her eyes she has little gumballs. i see her with bright blue eyes and pink glitter eyes. billy’s story: i was working at a veterinary practice and the morning after my night duty i was opening the practice up and found a cardboard box at the door. i opened the box and a pair of pale blue eyes stared up at me. it was a young jackdaw. i put my hands down ready to catch him as i expected the poor bird to fly away in a panic, instead he gently hopped onto my hand. a little ball of jet black feathers and big blue eyes. unfortunately he had a badly broken wing. wild birds are not the easiest of patients, the smallest infection can take hold of them, the vets didn’t have much hope for him. i took him home to give him some comfort and to give him a chance. that was 11 years ago. billy is still going strong. he never regained use in his wing so he was unable to be rehabilitated and released into the wild so he stayed with me. i have no idea how long we will have with him, he has already outlived the wild jackdaws life expectancy of 9 years. with age billy’s blue eyes have now turned silver along with the feathers around his head. i feel a slight sadness looking at his beautiful wings, the only sign of the injury is a slight droop. i wonder what it must be like to have wings but not be able to fly. i dont think he feels the same though. he’s not scared of anything, nothing stops him and he does it all while singing. i picked billy as my inspiration not only because he’s beautiful but because even though he is small, he is fierce. the lamplighter leaned against the lamp post on the darkened street. he gazed mesmerized into the window of the salon. he watched the angelic creature as she wove her footsteps into an ethereal magic. it was as if her dress was lit from within, by the stars themselves, and her feet captured the light of the heavens above, becoming part of the dance. julian had never witnessed such a performance. his heart danced along with her, forever lost to her beauty and grace. night after night he would watch through the windows, enchanted as lumiette graced the parlors of the gentry. he wished somehow he could meet her, know her… but he was nothing but a poor lamplighter with nothing to offer her. when it ended he would continue on his way lighting lamps, then returning home. one evening as he was about to depart, she exited the mansion. she gave him a wistful smile. her piquant face had a sadness to it. large luminous eyes met his and lit up. they were kindred spirits. they strolled down the damp street chatting away as if they had known one another all through the ages. from that night on, they were inseparable. two hearts entwined. lumiette continued dancing for wealthy patrons while julian toiled away saving everything he could. when at last he felt he had earned enough he made up his mind he was going to ask her to be his forever. he wanted it to be perfect…as magical as she was. he brought her to the woods at midnight, where he had set up a small feast under a tree filled with chandeliers. the setting was perfect. 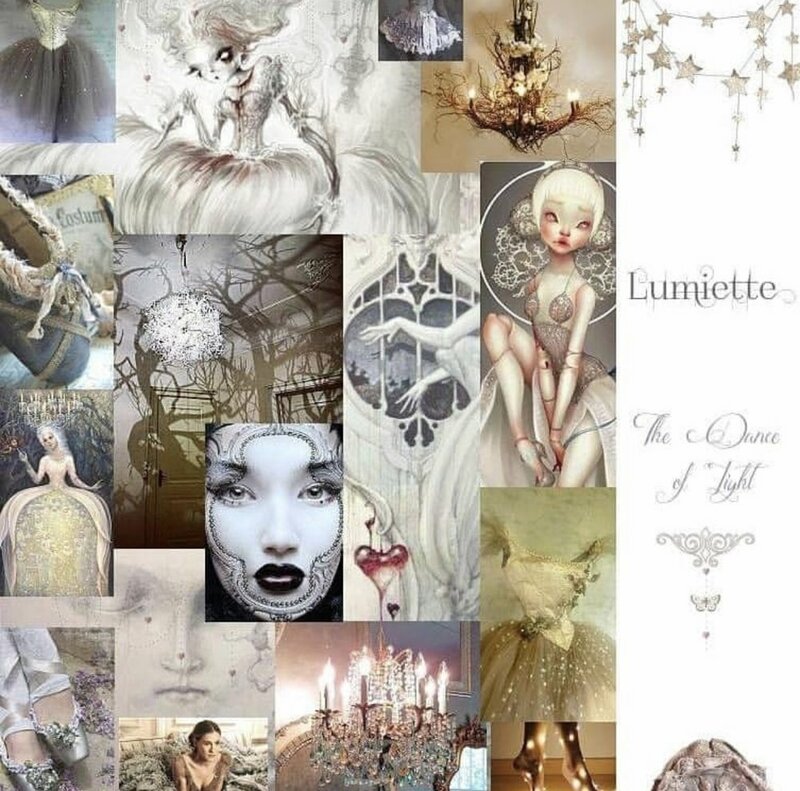 lumiette felt her heart swell with love for him even more. she got up and began to dance. more beautifully than ever before. the light swirled around her like fireflies. as her dance reached it’s climax it was as if the heavens themselves wanted to applaud. a brilliant flash of lighting struck the tree. one of the chandeliers crashed to the ground, striking lumiette as it fell. all was lost. julian could not bear her loss. his heart shattered like the broken chandelier at his feet. a villager found the tragic sight the following morning. lumiette laid out like a broken doll and julian’s body hanging in the tree. the light had forever gone out.